Bucks County authorities are investigating after the body of a man was found encased in ice in a pool in New Hope on Tuesday afternoon, 1/22. The man was found frozen in a pool behind the Logan Inn on West Ferry and Main Streets around 2 p.m. He had to be cut out. Officials have identified the man but have not released his name. Temperatures in the area started to tumble on Sunday afternoon reaching single digits by Monday morning. They do not know how long the body had been in the pool and are waiting on an autopsy for a cause of death. They are trying to determine if this was an accident or foul play. The Bucks County District Attorney's office, county detectives, and New Hope police are investigating. 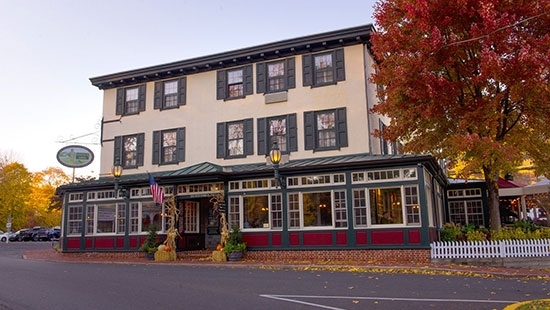 The Logan Inn was founded in 1727 and is one of the oldest continually operating inns in the country. UPDATE: The abandoned circular pool is located directly behind the Marsha Brown restaurant. It is surrounded by a high, locked fence. The body was discovered by a construction worker who was working at the adjacent Logan Inn. The Mansion Inn in located on the other side. After a sinkhole exposed part of the the Mariner East 1 natural gas pipeline in Chester County over the weekend, Sunoco has apparently hired security to watch the homeowner's property and guard the hole. Chester County District Attorney Tom Hogan had already opened a criminal investigation into the pipelines last month. He said in letter on Tuesday, 1/22, "When a Chester County Detective in plain clothes approached the scene, an armed man flashed a badge at the Detective and identified himself as a constable," Hogan said in a letter released Tuesday. "The Detective, who is familiar with all of the Chester County constables, asked the armed man who he worked for. The man then finally identified himself as a constable from Northumberland County in central Pennsylvania. When pressed further by the Detective, the man admitted that he had been hired as security by Sunoco." Sunoco says they hired the security at the request of the family. "We have engaged security on Lisa Drive at the request of the impacted homeowners to restrict access to their property as they were concerned not only with protecting their privacy, but the possibility of people trespassing on their property," company spokeswoman Lisa Dillinger said in a statement. "I will decline to discuss any further details of our security efforts, beyond that we do use security on our projects as needed to ensure the safety of our employees, our assets and those who live in the area." The Philadelphia District Attorney's office says that recently discovered file boxes related to convicted cop killer Mumia Abu-Jamal’s case do not show any involvement of former District Attorney Ronald D. Castille in the case. Last month, Abu-Jamal was granted a new chance to appeal his conviction because then State Supreme Court justice Castille did not recuse himself from Abu-Jamal’s 1998 appeal because of possible conflict of interest. District Attorney Larry Krasner will have to decide whether or not he appeals Common Pleas Court Judge Leon Tucker's decision to grant a Abu-Jamal a new appeal in light of the new evidence. Former Philadelphia Phillies P Roy Halladay was posthumously voted into the Baseball Hall of Fame on Tuesday, 1/22. The induction ceremony will be held on July 21. Roy was selected on his first-ballot. In November 2017, Halladay was tragically killed when a plane he was piloting crashed into the Gulf of Mexico. He spent his first 12 seasons with the Toronto Blue Jays and the final four with the Phillies. He won the AL Cy Young in 2003, the NL Cy Young in 2010, and was an 8-time All-Star. Also in 2010, Roy threw a perfect game on May 29 vs. Marlins and a no-hitter against the Reds in the NLDS. Mariano Rivera, Mike Mussina and Edgar Martinez were also voted in. Rivera is the first player to ever receive 100% of the votes.